Issue 277 : April 2019 (ISSN 1365 - 070x) Monthly, next issue May 13th 2019. Old Olympus stand with modified Stackshot added. Image by Christian Autotte. Our Mobile site is here. Please do not contact the above for image permissions. Each article contributor retains the copyright to their material so should be contacted directly via the link in the relevant article. Thank you. Comments on Micscape and contributions welcomed. Contributions: Any modern format welcomed i.e. pdf. doc/docx with embedded images, or html + jpegs. Bizarre protozoan (Stentor) disintegration by Chew Yen Fook, New Zealand - Sharing his observation of a stentor ciliate disintegrating right before his eyes. A compilation of useful diatom resources on the Web by Phil Sydor, UK - a comprehensive, up-to-date list of resources for the diatomist. A bouquet of images: A tribute to my lovely wife, Adri, on her 80th birthday by Richard L. Howey, Wyoming, USA - twenty-seven images as a little bouquet of tribute and an expression of a 'cranky' microscopist's love. Toothpaste, sun screen, tuna, plastics, alcohol, and prescriptions by Richard L. Howey, Wyoming, USA - a philosophical look at some everyday remedies, cures, and fixes and their effectiveness. Topical Tip: The value of a numerical aperture v field of view graph for macro / micro setups owned - how this plot can aid the choice of setup for a given subject by David Walker, UK. Focus Stacking Technique Explained by Mol Smith, UK - What is focus stacking? Why is it an important tool? Slow motion for Microscopists. Spring is here. What about the Bees? Interactive honeybee Apis worker, explore the parts by David Walker. (July 2005). We are delighted to receive contributions small or large from microscopy enthusiasts whether a novice or expert. If you have an image, tip or article, why not share it, this magazine is what you make it! Micscape Magazine past issues online (read articles online using the original illustrated index for each month). News - special notices - misc. External links. Updated April 2019. Below are some of our favourites, which includes sites with extensive links and/or resources for the optical microscopy enthusiast. 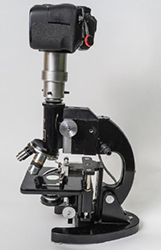 External Microscopy forums: Places to discuss the hobby or to raise queries. www.photomacrography.net forums, galleries, articles on macroscopy and photomicrography. Yahoo groups: a 'P' denotes current and archived messages are public i.e. not limited to members. Amateur Microscopy (>6000 members, very active). Also specialist groups e.g. for users of given maker's microscopes (e.g. Zeiss, Olympus, Wild, Vickers). Try a Facebook Group Search with keywords like microscope or microscopy to find these. Microbe hunter the website ably run by Oliver Kim has built up a popular and valuable forum with help for both the beginner and more advanced user. Algae-L 'Forum for marine, freshwater and terrestrial algae'. Access to Archives possible for non-subscribers. Mikrobiologische Vereinigung München e. V. Wide range of articles and resources in German. Le Naturaliste French based forum and image gallery for micro / macro but open to non French speaking international contributors. Royal Microscopy Society Journal, 'infocus' and other resources for members and the community. Quekett Microscopical Club Journal, Bulletin and meetings for members. Little Imp Publications public domain books collated by Steve Gill formerly on CD and now free on Micscape. Mikroskop Museum German website with resources on microscopes / makers . Fun Science Gallery projects, articles on optics in English and Italian. Independent Generation of Research (IGoR) - Wiki style resource for citizen scientists to share their work. Collected Letters of Antoni van Leeuwenhoek ('Alle de Brieven ..') transcribed and free online at DBNL. Klaus Kemp's 'Diatoms' website - offers regional strews and arranged prepared slides of diatoms, an 8 form test slide, radiolaria, insect scales etc and prepares arranged slides on commission. Historical makers of microscopes and microscope slides Brian Stevenson's extensive resource . David Jackson's Better Microscopy blog. Regularly updated free resources extending from his 'Better Microscopy' series of books. Stefano Barone's Diatom Shop sale of his own prepared and arranged slides of diatoms, radiolaria, forams and scales. www.testslides.com website devoted to Stefano Barone's Diatom Lab test slides. Micscape is a free magazine for enthusiasts funded by Microscopy-UK and dedicated to non-commercial microscopy.